Many, many years ago (at least five), Finn Arne linked me to this essay on structured procrastination. I was struck by its good sense and wise suggestions. And I have been trying it out ever since. Not always with great success (unless you count knitting sweaters and reading books quite unrelated (or only vaguely related) to my work -- not to mention keeping up to date on geek culture and a selection of television series -- as a form of achievement), but certainly with a bad conscience (which is the standard second place when procrastination is concerned). Recently, however, I found a very good tool. I have been well aware of the benefit of keeping to do-lists. The trouble is that they tend to either be on post-it notes or pieces of paper that I invariably lose, or expect to lose; and the other is that they frequently disappear from sight (and consequently mind) and therefore fail to remind me of the thing I need to do. This has not been a big problem in terms of getting things done, but only because I never quite relax and trust these notes. The downside to that, however, is a constant presence of low-level stress which is the perfect breeding ground for procrastination. 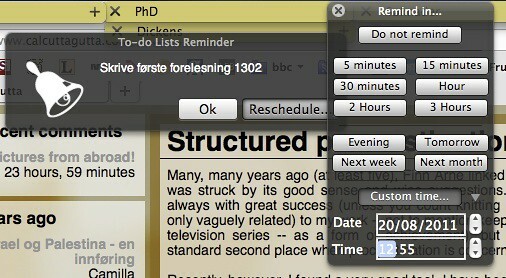 I have lately (over the last year or so) taken to using the ``Stickies'' application on my mac, and that worked quite well (because I would have a look at them whenever I was procrastinating, and therefore could do something sensible instead of something ... less so). 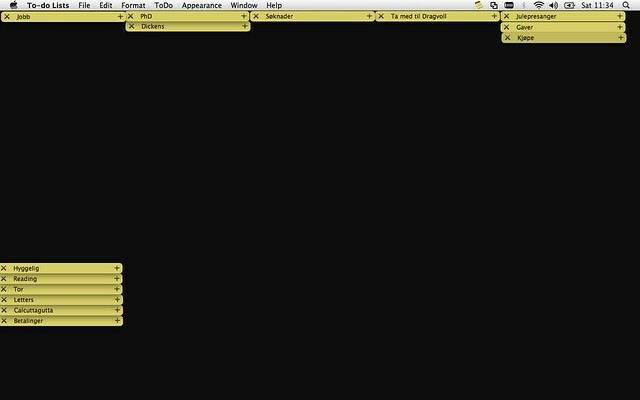 However, the trouble with ``Stickies'' is that it provides no sense of accomplishment. There is a momentary reward in being able to delete an item from the list, but it does not last (because, once deleted, the item is gone). I missed the post-it/scraps of paper bonus of being able to see that I had ticked something off the list. I am a little like a 5-yearold like that: I want golden stars, even for having sent an e-mail. And so I went to the App store and looked around for a Widget that I vaguely remembered, which would let you cross off items by ticking a little box (I love ticking little boxes). Instead I found something even better. It cost me 7 nok (roughly 70p), and I am very happy with it. It is called, ``To Do-Lists'' (very nice name, I thought). I had looked at some more advanced ``time management apps'' as well, but they all seemed to provide more potential for procrastination than they seemed to help counter it. I do not have alarms on all entries, only the ones that I must remember to do at particular times or within the next couple of days. I have decided to clear the lists (certainly the work list and similar) every week-end, ready for a new start on Monday. That way, I can see, as the week progresses, that I have actually gotten things done. That is a good feeling. And probably conducive to good mental health. I think this is exactly what you need. Let me know how it goes. Is there a PC version? I don't know about PC versions. I am sure there must be something similar out there, but I would not know where to look. 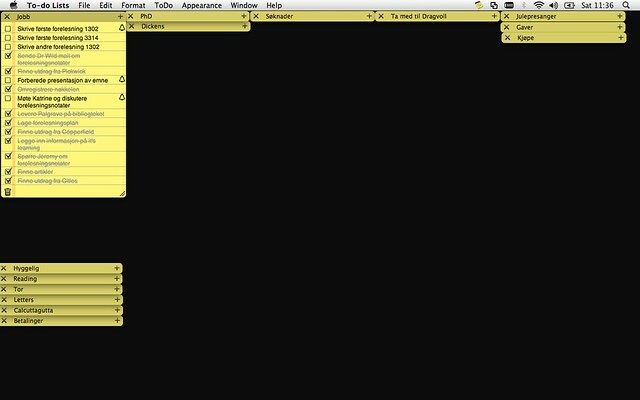 I also have the problem of procrastination each time I open my Mac, and would probably fail to update the To Do-Lists (the neatly structured lists qualifies Camilla as Structured Person). My solution is a list of plain ol' white paper (discarded printouts cut in two - ah, easy recycling!) tied together with a nice ribbon, lying on my office desk. Each Monday I remove the old list and start a list on a new page, which of course is separated into each weekday. The trick, in addition to include pleasant tasks like Camilla mentioned, is to divide bigger tasks into several smaller ones, so that they are more easy to start on and finish. And this way you get to cross out A LOT. The drawbacks are, of course, that it's harder to implement tasks that are one week or more ahead, and that a paper list won't tell you about the important deadline/appointment/lecture unless you remember to look at it. I will consider trying out the To Do-Lists for that reason. Anyway, to do-lists are very helpful and I don't know how I managed my workday without them. And now I should really get back to my list. I always prefer to do things by hand, rather than digitally, if possible. And making the to-do list pretty sounds like a good plan as well (it is strange how much that sort of thing matters -- I am sure it ties in somehow to what I wrote about hats: the aeasthetic experience is important: I have written most of my PhD in lovely Moleskine notebooks, for example -- impractical, but lovely). And I could not agree more about the cutting large tasks into smaller ones. It is the only way I can face doing almost anything at all. I think I should visit the hat shop in Trondheim with the purpose of buying a hat for the autumn season.